The votes were in and counted (over 16,000 were received) and it was finally time to announce the crème de la crème of Bradford’s Community Stars and our Early Years’ winner at the ceremony on 6 December 2018 at The Bradford Hotel. The competition was tough with local dad champion, Suhaib Ahmed and the Parents in the Lead panel both nominated for the Early Years’ category. 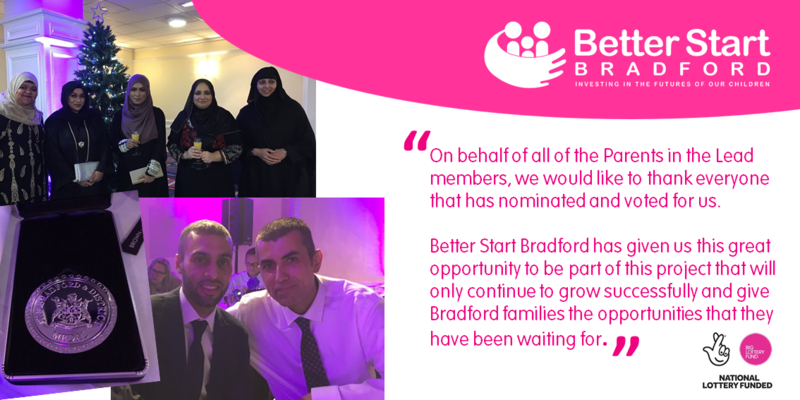 Suhaib is a local dad of three who has been nominated for his work with other fathers in the community through Better Start Bradford, as well as acting as a role model for other dads in Bradford. In order to pass on his own experience, he set up ‘DadTalk’ so fathers in the community could attend drop-in sessions to learn more about the development of their children from birth. The Parents in the Lead Panel is a group of local parents who volunteer their time to support other groups who wish to set up activities and apply to Better Start Bradford for funding. The panel meets regularly to make key decisions on funding applications and provides support and guidance to applicants. They are very dedicated and go out of their way to source, encourage and provide guidance to those applying. Finally after seven preceding awards, the time came to announce the ‘Outstanding Contribution to Early Years’ Award’. Suhaib and the five representatives from the Parents in the Lead panel waited with baited breath while Vipin Joshi, Chair of the Better Start Bradford Board, opened the ‘Oscar’ style envelope to announce that the Parents in the Lead panel had won the award with Suhaib as a more than worthy runner up. The Community Stars Awards are in partnership with Telegraph and Argus, Bradford Council and the community campaign ‘People Can Make a Difference’.